On a sabbatical from trail blazing post / industrialists Scattered Order, Mitchell Jones has adopted the name "the little hand of the faithful". 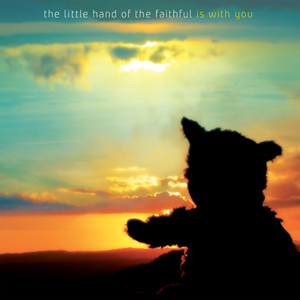 The debut release "is with you" is an album of instrumental tracks with messed up guitars, odd beats, synths, found sounds and samples, which combines to form a foreboding and urgent atmosphere. Sometimes this intensity is balanced by a haunting melancholia, with always a tiny glimmer of hope poking its head over the parapet. 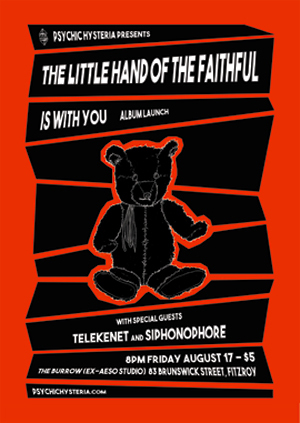 is with you's Melbourne launch date is set for Friday August 17, with a celebration that night at The Burrow (previously Aeso Studio) featuring the little hand of the faithful in duo mode, and very special guests Telekenet (Peter Bramley) and Siphonophore (Evan Carr).